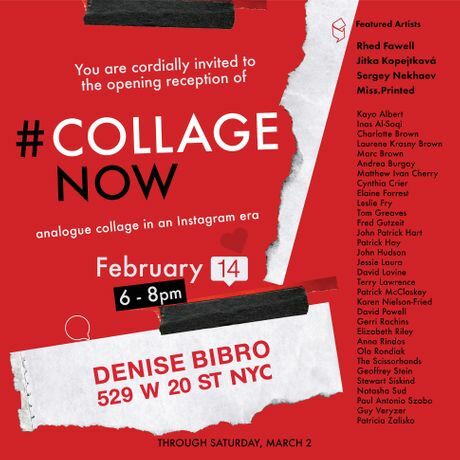 Denise Bibro Fine Art, Chelsea, NYC, is pleased to announce, #Collage Now. Analogue Collage in an Instagram Era. The exhibitions runs February 14 - March 2, 2019. Collage is a medium that has been employed by artists for centuries and by numerous fine artists including Matisse, Picasso, Braque, and Schwitters to name a few. "A piece of art made by sticking various different materials such as photographs and pieces of paper or fabric on to a backing." Social Media... regardless of what one thinks and feels about it is an integral part of life today. No one can deny that. It impacts almost all of us one way or another in various degrees. The traditional venues of communication are only alternatives but not employed by many as the norm. The art world... whether it is an artist, collector, gallery, or a museum have had to use and relate to these new tools, and forms of delivery and communication. Instagram, Twitter, Snapchat and Facebook are here and cannot be denied even though the implications and interpretations can be both simultaneously good and bad. We have chosen to highlight two specific things: Collage Artists and Collage Artists that have mastered the use of Instagram as a platform to promote and expose their art. We have invited four artists who have stellar Instagram followings: Rhed Fawell, Jitka Kopejtková, Sergey Nekhaev and Miss.Printed to show alongside 32 other collage artists from around the world. These artists not only create exceptional collage, but they have also mastered Instagram to share their work internationally. By having this exhibition, we are pushing the throttle further to expose and engage the viewer in this well-deserving medium. Collage artists from all over the United States, the United Kingdom, and Europe have submitted fantastic examples of this interesting and centuries established medium. The collages chosen are to provoke the viewer to see the 3D in a primarily two dimensional medium. There will be what some would refer to as traditional two-dimensional collage methods of cut up materials such as photos, print matters, drawings, maps ... and there are those that are comprised of similar materials but in a three-dimensional format, with paper and wood construction that expand the formats. These broad range of artists offer numerous aesthetics; political, social, important gender and body issues, fashion and environmental politics to name a few. Others create fantastical hypothetical worlds and have allegorical and mythological elements. Many evoke narratives and possible stories to share. Opening Reception, Thursday, February 14, 6 – 8PM. Many of the artists will be present.